Welcome to this charming townhouse on the first sea line, overlooking the mountains of the Natural Park of Llevant. The two-storey house contains 3 bedrooms on the first floor. The master bedroom has a double bed, an en suite bathroom with spa bath and a balcony with sea views. The other two bedrooms have two single beds each and share a bathroom with a bathtub. All rooms are air-conditioned and have wardrobes. On the ground floor you find a spacious and air-conditioned living room with sea views where you can enjoy relaxing moments watching satellite TV (German), surfing the internet (Wi-Fi) or simply admiring the view. The dining table has space for 6 people. The kitchen is equipped with all necessary utensils like ceramic hob cooker, electric oven, fridge freezer, toaster, blender, coffee machine etc. In the backyard of the house there is a terrace with barbecue. Evidently the house provides with a washing machine, dryer, iron and ironing board. The main terrace of 16 m2 is next to the entrance of the house and is furnished with a table and 6 chairs. It can be a nice place to have summer meals enjoying a sea view. 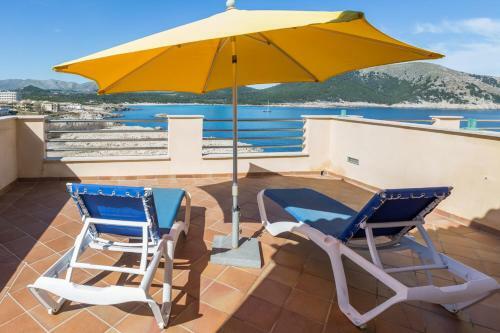 On the second floor there is another terrace of 20 m2 with 2 sunbeds and a parasol. You can park your car on the street. The house was built in 2005 along with the other 5 townhouses. The cove Cala Lliteres is one of the quietest in Cala Ratjada where mainly family tourism predominates. In Cala Ratjada you find all the amenities needed for a vacation: restaurants, supermarkets, medical center etc. The Natural Park of Llevant offers a plenty of sandy beaches like Cala Torta where you can enjoy fresh fish on the beach. You can also visit the town of Capdepera with its castle dated from 14th century. Do not hesitate and make your vacation in this house! Pets are not allowed. Note: The rental of this property is based on the Spanish Law on Urban Leases (29/1994, 24th November). According this law the property is available for seasonal renting.